Weekends, evenings, certain holidays, and in-home tutoring. Additional transportation charge may also apply for in-home. Non-prime time or summer hours. Must be ongoing, regularly scheduled sessions of multiple hours per week. Ask about options for different circumstances. Up to 2.5 hours of time including initial telephone consultation. May be used for conference, telephone, document review, consultation with other professionals, or written recommendations. No student meeting. Broad academic screening or brief cognitive and achievement screening. 90 minute student session. In depth assessment of a single academic skill area including recommended learning strategies. In depth assessment of academic skills including specific instructional recommendations. Assessment of learning profile including specific follow-up recommendations. Assessment of learning profile, academic skills, and analysis of discrepancies among these; includes follow-up and instructional recommendations. Educational evaluation with Mark Carey and evaluation of attention, social-emotional, and/or behavioral status with psychologist Dr. Laura Anderson. Evaluation of attention, social-emotional, and/or behavioral status with psychologist Dr. Laura Anderson. Evaluation and other consultation is available on all Hawaiian Islands. The above evaluation and consulting services can be provided on any island for a small additional fee and travel costs. Billing for Tutoring: A statement will be delivered in person or by mail at the end of each month of service. Payment is due by the end of the following month. Statements are not itemized by date as each session has been individually documented at the time of service. Billing for Evaluation: In some cases, a partial payment will be requested in advance of the evaluation sessions or the final report. Payment in full is expected within 30 days of receipt of the final report unless an extended payment schedule is agreed upon in advance. Late Fees: A late fee of 1.5% per month (minimum of $10) will be added when payment is not received by the due date. 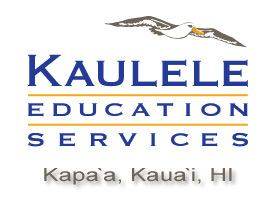 Payment Form: Please make checks payable to "Kaulele Education Services;" your cancelled check is your receipt. Cash is acceptable; a receipt will be provided. Credit cards are not accepted. Cancellation Policy: Clients will be billed for appointments missed without notice. Clients will also be billed for appointments cancelled without reasonable notice. 24 hours does not necessarily constitute reasonable notice. For example, when a student is ill at the last minute, a phone call just prior to a session may be reasonable notice, while a student who has been ill for several days but does not contact us well in advance may be subject to billing for the session. More than 24-hour notice is required for athletic events, medical appointments, travel, or other conflicts that are known to the student more than 24 hours in advance. Alternate Arrangements: By prior agreement, some charges may be paid over a longer period than the usual expectation. For example, arrangements may be made to pay for an evaluation in several monthly installments, and a summer tutoring program can, by arrangement, be paid for over several months. Late charges will apply if prior arrangements are not made. Scholarships and Financial Aid: Kaulele has been proud to offer scholarship assistance to many families who otherwise would not have been able to manage the full cost of service. Between 2003 and 2010, the Walter and Marcia Kortschak family as well as dozens of other island families provided nearly $175,000 to directly aid others through Kaulele Education Services. While these funds are currently extremely limited, should your family require financial assistance for services here, please feel free to inquire about limited support that may now be available. Because Kaulele is not a tax-exempt organization, donations are not tax deductible. However, 100% of contributions are used directly to help struggling students and families provide achieve critical academic success they would not otherwise experience. Please consider that your contribution can make a dramatic difference in a student's life. You may direct your contribution for a specific student or family or add it to the general scholarship fund to applied as we determine most effective. Contributions may be anonymous or will be acknowledged according to donors' wishes.